This book contains updated versions of a set of papers presented at the International Conference on Agriculture and Economic Development-A Symposium on Japans Experience which was held in Tokyo, July, 1967. 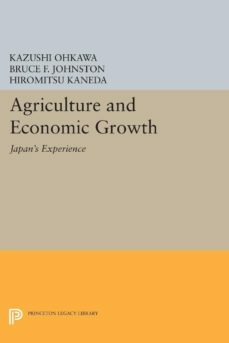 These papers make a comprehensive reappraisal of Japans agricultural development and its relevance to economic growth over the last 100 years. They emphasize long-term studies in analyzing Japans agricultural development, with the century following the Meiji Restoration as the historical setting. Intensive consideration is also given to the Meiji Era, 1868-1912.Part I considers the historical phases of Japans development, and attempts to give a comprehensive exposition of Japans long-term growth. Part II deals with productivity growth and technological progress; Part III treats agricultural population and labor force; Part IV includes papers dealing with exports of primary products, credit and financial institutions, farm-household savings, the impact of Land Reform, and food consumption patterns.Originally published in 1970.The Princeton Legacy Library uses the latest print-on-demand technology to again make available previously out-of-print books from the distinguished backlist of Princeton University Press. These paperback editions preserve the original texts of these important books while presenting them in durable paperback editions. The goal of the Princeton Legacy Library is to vastly increase access to the rich scholarly heritage found in the thousands of books published by Princeton University Press since its founding in 1905.